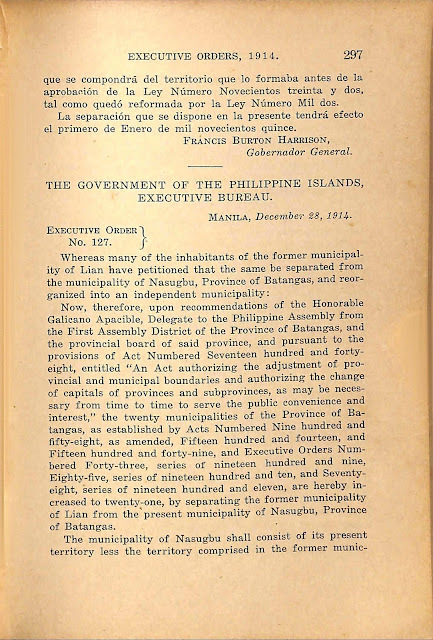 The western Batangas coastal town of Lian is in the present day a 3rd income class municipality with a land area of 3,119.75 square kilometers and a population of 52,660 as per the 2015 Philippine Census1. 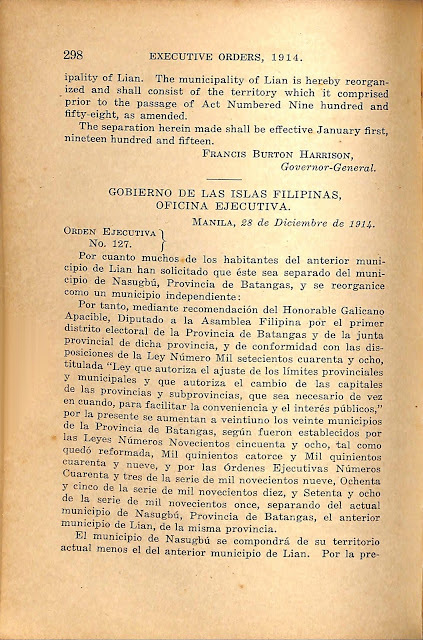 Lian used to be part of the larger town of Nasugbu until an executive order2 signed by then-Governor General Francis Burton Harrison in December of 1914 converted it into a distinct town. NOW, therefore, upon recommendations of the Honorable Galicano Apacible, Delegate to the Philippine Assembly from the First Assembly District of the Province of Batangas, and the provincial board of said province, and pursuant to the provisions of Act Numbered Seventeen hundred and forty-eight, entitled “An Act authorizing the adjustment of provincial and municipal boundaries and authorizing the change of capitals of provinces and sub-provinces, as may be necessary from time to time to serve the public convenience and interest,” the twenty municipalities of the Province of Batangas, as established by Acts Numbered Nine hundred and ﬁfty-eight, as amended, Fifteen hundred and fourteen, and Fifteen hundred and forty-nine, and Executive Orders Numbered Forty—three, series of nineteen hundred and nine, Eighty-ﬁve, series of nineteen hundred and ten, and Seventy-eight, series of nineteen hundred and eleven, are hereby increased to twenty-one, by separating the former municipality of Lian from the present municipality of Nasugbu, Province of Batangas. 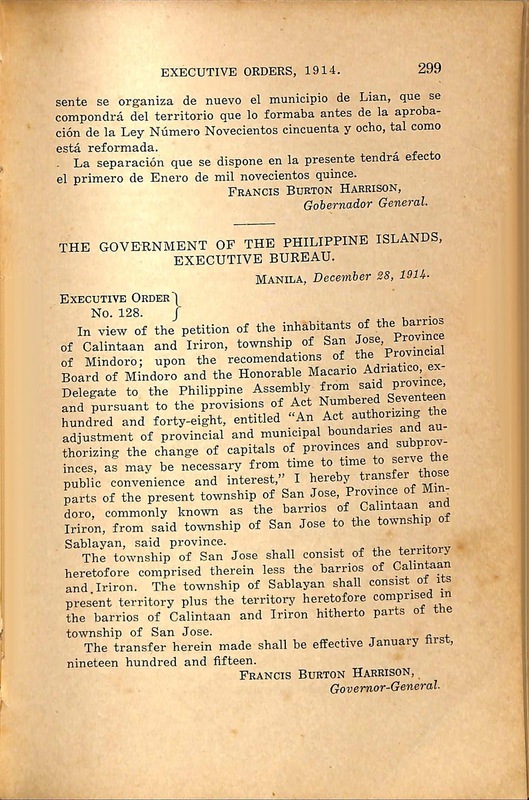 The municipality of Nasugbu shall consist of its present territory less the territory comprised in the former municipality of Lian. 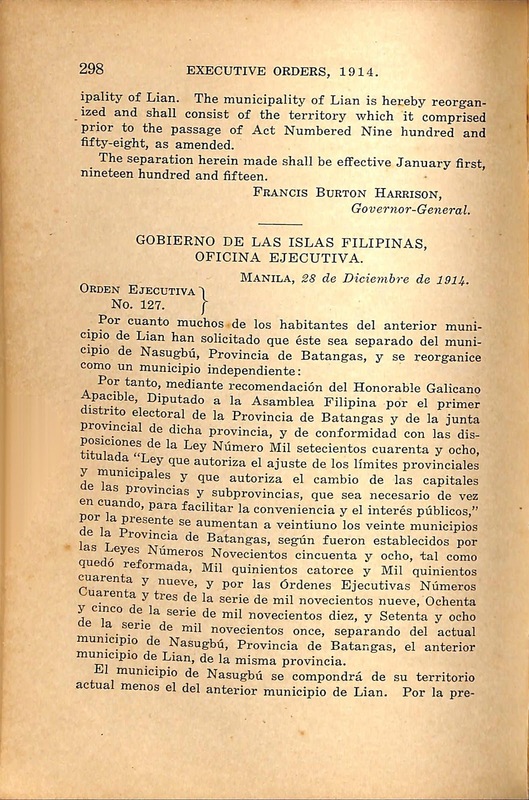 The municipality of Lian is hereby reorganized and shall consist of the territory which it comprised prior to the passage of Act Numbered Nine hundred and ﬁfty-eight, as amended. The separation herein made shall be effective January ﬁrst, nineteen hundred and ﬁfteen. 2 “Executive Orders Nos. 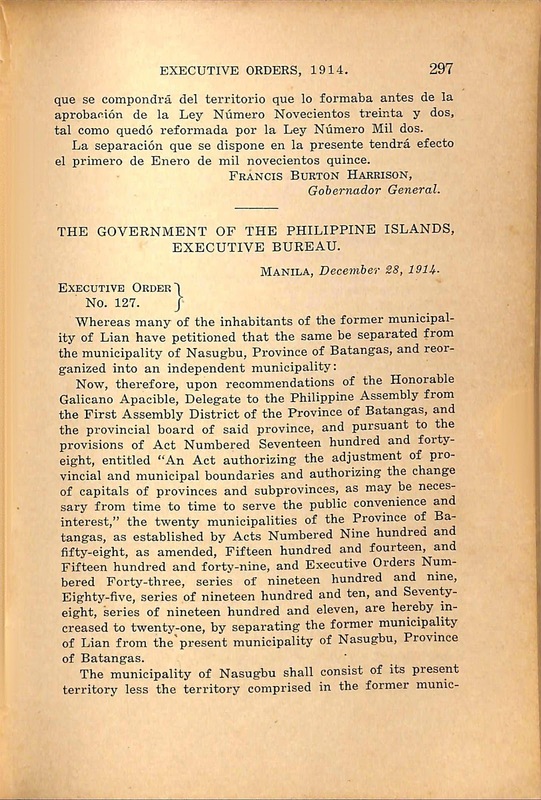 1-133 (1914),” online at the Internet Archive.